How to breakout 100G link into 4x 25G for going to different purpose? A type-B female MPO/MTP-4x LC harness cable is required. The following shows the 4x 25G SFP28 transceivers interconnection with 1x 100GBASE-SR4 QSFP28 transceiver by one MTP-4LC harness cable directly. We used to buy 1G/10G modules from FS, and this year we upgrade to 25G 100G project. They give me perfect solution and products, and confirmed every details, very nice! Good products! Good team! Will back again for my future project. Once I received the 25G modules, I tested them, and all of them worked great, without any issues. I used the transceiver soon after it came. There's no problem! Excellent! The delivery was faster than expected and a nice package. They had the 25G SFP28 transceiver I needed, at a very fair price. The delivery was faster than expected and a nice package. Thank you! Looking forward to doing more business with you. FS is always useful. Now we turn to 25G/100G deployment, and can find all the items we need here. We tested this 25G optic and it worked well. We've decided to purchase them in bulk for our DC. Before bought the module, I was worried about the compatibility with my switch, so I purchase only two for test. It proved that there is nothing to worry about, I will purchase more soon. The purchased optical modules from FS are working fine. This is my test order for 25G products in FS.COM, more than I expected, working great, well packaged. 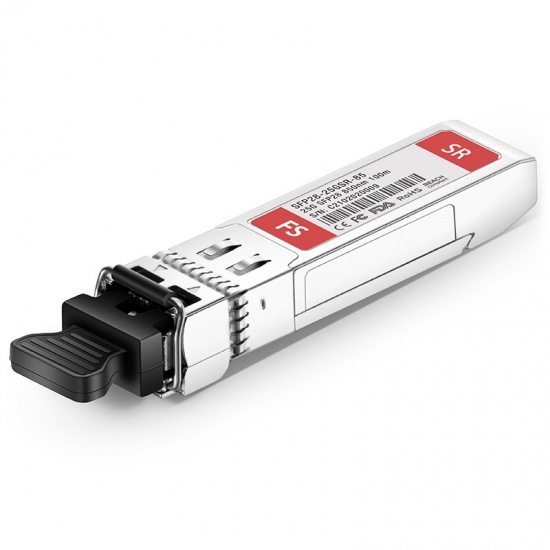 I bought this 25G transceiver for my data center upgrading, it works very stable while the price is very competitive. Good experience. This is my first time ordering 25G products from FS.COM. The performance surprised me. It works very well in my data center. I think it is worth ordering again.